Verdecia isnt there to get to know the kids, break up fights or do the typical community-policing that school resource officers typically do, said MSA Principal Bill Jones. "Were not looking for a fair fight," Jones said in an interview cited by the New York Times. "Were looking at an overwhelming advantage." In order to become a guardian, Verdercia completed the 144-hour training course that the Manatee County Sheriffs Office ran for the school district, plus additional training to be qualified to carry the rifle. District general counsel Mitch Teitelbaum said while school district guardians are trained using 9-millimeter Glocks, charter schools have the freedom to arm their guardians with other weapons. 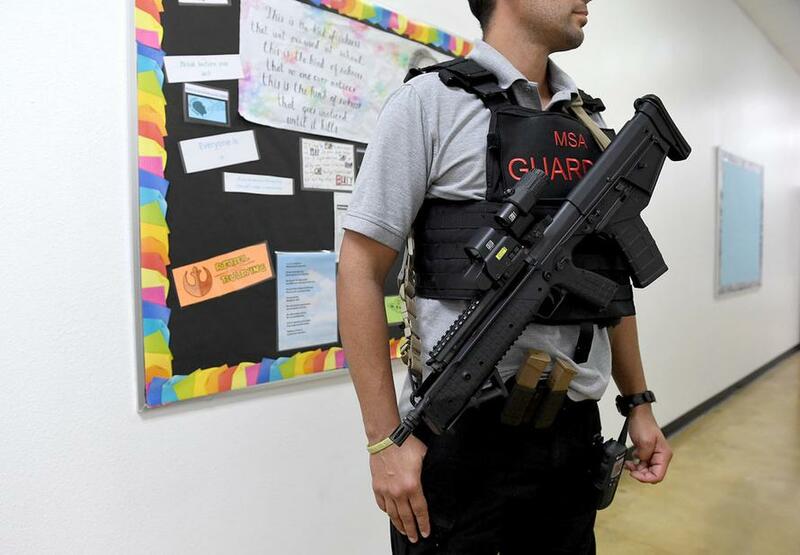 To hire Verdecia and his new co-worker, MSA took advantage of a law passed by Florida lawmakers in the wake of last February's shooting at Marjorie Stoneman Douglas High School requiring all schools to have armed security. Most districts achieved this through a combination of school resource officers and guardians - and most just carry handguns, according to the Herald Tribune. Principal Jones justifies the decision to arm Verdecia with a rifle. "Its just a much more effective weapon than the handgun is." "Its not something that we typically advise our clients to do for a variety of reasons," said Dorn, noting that someone might knock the officer out and take the weapon, and it's not as easy to subdue and handcuff someone while carrying a rifle. "You dont walk around with an assault rifle strapped to your chest in a school. That is not the normal policy of police agencies," said retired police chief Walt Zalisko, who now owns a Daytona Beach-based global investigative group and police management consulting business. So why would we not want the school guardian to have parity with that potential threat?" No problem with that. But why the 3X scope? Also, he's going to be the first one shot. I say arm the teachers with concealed carry. Arm the janitors, bus drivers & cooks via constitutional carry. Crosswalk guards too! "I wouldnt hire anybody who hadnt been shot at and fired back," said Jones. A lot of gang-bangers would qualify. Sounds like that school is serious about protecting their students & staff !!! Good for them !!! But they need more guards armed like that !!!
" why the 3X scope? " Maybe he thinks it will give him more accuracy. Sure. If his target is 200 yards away and he has time to line it up in the crosshairs.